Powers/Abilities: Able to turn invisible. History: Kent Thurston somehow gained possession of a hooded robe which had been treated with a special chemical, allowing the wearer to become invisible. 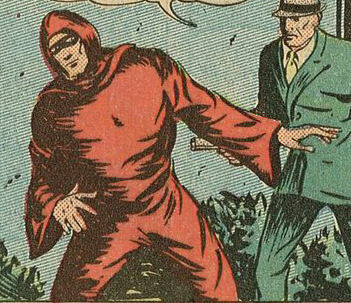 He used this to become the crimefighting Hooded Justice, then swiftly changed this to Invisible Justice, and finally the Invisible Hood. Comments: Created by Art Pinajian. 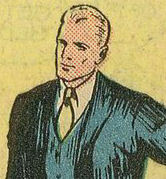 The character appeared in issues #1 to #32 of Smash Comics. After he became the property of D.C. Comics, it was revealed he had died at Pearl Harbor as one of the Freedom Fighters. Post-Crisis on Infinite Earths, he got a reprieve, and it turned out he had survived but was captured by the Japanese, only to eventually die, post-War, in a battle with the Mist and the Icicle.